In terms of female empowerment today, 40 is the new 30. On the positive side, women now have more flexibility in terms of their roles outside of the traditional household setting and career choices. However, this is not that case when it comes to fertility. Having children at a later age has a negative effect on a woman’s childbearing abilities. This in turn has resulted in a greater demand for assisted reproductive technologies (ART). ARTs can help both men and women who are experiencing fertility problems. For women, one such problem can be a diminished ovarian reserve. What is Diminished Ovarian Reserve (DOR)? Unlike men, who produce in excess of 1,000 sperm cells a second well into their fifties and beyond, women are born with a finite number of eggs. These are released over a set period of time. Both the quality as well as the quantity of eggs decreases with age. This means that experiencing a pregnancy later in life increases the chances of having a child with certain congenital deformities1,2. As women grow older, they will have fewer viable eggs and consequently, lower chances of getting pregnant. From an evolutionary perspective, this mechanism makes sense as it ensures that women give birth at a time in their lives when they are most capable of raising healthy children. Diminished ovarian reserve (DOR) is a condition in which the ability of the ovaries to produce eggs on a monthly basis declines. This can be because of advanced maternal age or a number of other factors. 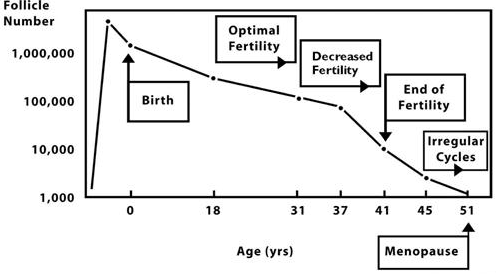 Ageing is only one cause of diminished ovarian reserve. The condition can also be caused by surgical procedures such as the removal of ovarian cysts3, genetic factors4, and certain medical conditions that result in reduced fertility such as hyperthyroidism5. A vast amount of literature also highlights the effect of lifestyle and stress levels on a woman’s ability to produce healthy eggs 6. It has long been established that elevated levels of the stress hormone, cortisol, affect the production of gonadotropin-releasing hormones. These are regulated by the pituitary gland and in turn, control the menstrual cycle. Elevated stress levels can disrupt this cycle and interfere with fertility. Another key factor which has been shown to have a detrimental impact on fertility is smoking7. Multiple studies have shown that smoking can directly cause infertility in women who are otherwise healthy. It has been found that smoking can directly deplete a woman’s ovarian reserve8. Diminished ovarian reserve is not easily detectable. A woman can still experience regular menses with no signs that her egg stores are being depleted faster than usual. DOR is often only detected when a woman has a number of failed pregnancies9, or has difficulty becoming pregnant despite trying a number of methods to boost her fertility. Diminished ovarian reserve can be diagnosed using a spectrum of tools. The follicle-stimulating hormone (FSH) measurement is the most commonly used endocrine test for DOR. This is because it is non-invasive, cheap and provides information in understanding a woman’s fertility profile. Reproductive endocrinologists may request blood samples to determine elevated FSH. High levels of this hormone signal that follicles are maturing at a faster rate and reducing egg reserves quicker than normal. A blood sample is taken on Day 3 of a woman’s menstrual cycle. Additionally, AMH (Anti-Mullerian Hormone) levels can also be taken on Day 3 to assess a woman’s ovarian reserve. This test can be taken any day of the cycle, but you get the best results when blood is taken on Day 3. On the minimally invasive and expensive end of the spectrum, reproductive endocrinologists may recommend ultrasound tests to determine egg reserves. The Antral Follicle Count is typically done before an ART intervention. This allows the endocrinologist to manually count the number of follicles that would eventually become mature. Follicles are fluid-filled sacs which host eggs until maturity. The higher a woman’s AFC value is, the higher her chances are of producing viable eggs, often with the help of a follicle-stimulating hormone. The treatment used for DOR depends on its causes. Numerous studies have shown that a woman’s age is directly related to her egg count. The older a woman is, the fewer viable eggs she has10. Therefore the best way of tackling DOR is simply to try to conceive a baby before the age of 35, which is when a woman’s egg reserves start to dwindle. If you have DOR alongside another medical condition, such as hyperthyroidism, then the preliminary condition has to be treated first before addressing the underlying fertility issues. Similarly if the DOR is caused by stress and smoking, these factors have to be eliminated first to determine whether their absence results in a higher fertility level. In an ART setting, ovaries can be stimulated by Clomid and other gonadotropins. These hormones will not necessarily raise the levels of ovarian reserve, but they will make the eggs which are available and receptive mature, so that they are ready for fertilization. Since the female ovarian reserve is determined before birth, the best way to maintain an adequate supply of eggs is to stop any activities which deplete egg reserves at a faster rate than normal. A key way of doing this is stopping smoking and controlling stress. Diets containing protein and unsaturated fats (olive, avocado and pumpkin seed oil) as well as being high in fibre leads to better mental and physical health, which can affect a number of processes in the body. This facilitates smoother metabolic processes crucial for reproduction. Other natural ways of dealing with DOR are making sure you take part in regular exercise, get enough sleep, acupuncture, massage therapies, and having a strong support system of family and friends. The most recent breakthrough in the field of assisted reproductive technology is in the use of dehydroepiandrosterone (DHEA). This was used as a non-prescription food supplement but it has been accidentally discovered that it improves ovarian function11, increases fertility, and decreases the incidence of miscarriages. Recent studies have indicated that DHEA directly increases the number of antral follicles in subjects that have had DHEA supplementation in the long- term. Given the finite number of eggs that women are born with, ovarian reserve can be considered a fixed variable in the pregnancy formula. Yet despite the limitations imposed by nature, pregnancy can still occur if the egg store is carefully manipulated.